Enjoy the top 112 famous quotes, sayings and quotations by N.K. 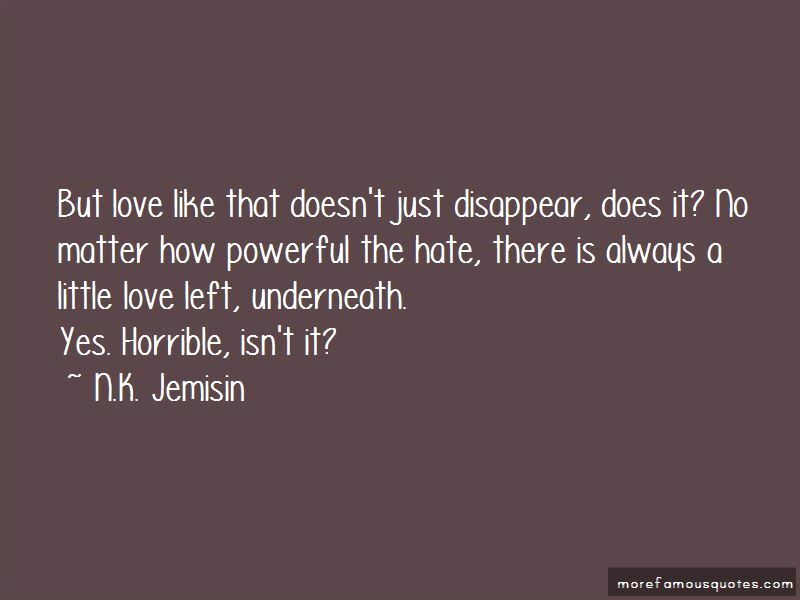 Jemisin. “But love like that doesnt just disappear, does it? No matter how powerful the hate, there is always a little love left, underneath. “But love like that doesn't just disappear, does it? No matter how powerful the hate, there is always a little love left, underneath. 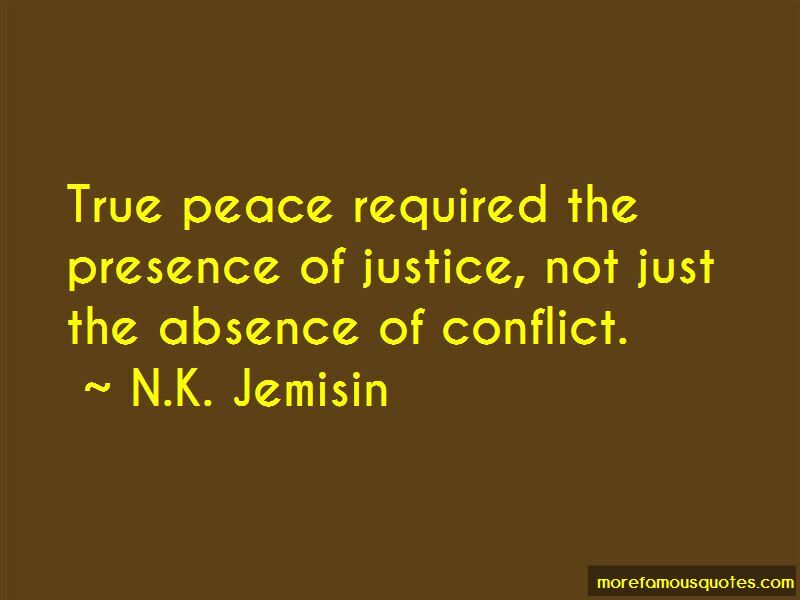 True peace required the presence of justice, not just the absence of conflict. You're very lucky ... Friends are precious, powerful things - hard to earn, harder still to keep. You should thank this one for taking a chance on you. I remembered Nahadoth's lips on my throat and fought to suppress a shudder, only half succeeding. Death as a consequence of lying with a god wasn't something I had considered, but it did not surprise me. A mortal man's strength had its limits. He spent himself and slept. He could be a good lover, but even his best skills were only guesswork - for every caress that sent a woman's head into the clouds, he might try ten that brought her back to earth. They live forever. But many of them are even more lonely and miserable than we are. Why do you think they bother with us? We teach them life's value. J. R. R. Tolkien, the near-universally-hailed father of modern epic fantasy, crafted his magnum opus The Lord of the Rings to explore the forces of creation as he saw them: God and country, race and class, journeying to war and returning home. I've heard it said that he was trying to create some kind of original British mythology using the structure of other cultures' myths, and maybe that was true. I don't know. What I see, when I read his work, is a man trying desperately to dream. Dreaming is impossible without myths. If we don't have enough myths of our own, we'll latch onto those of others - even if those myths make us believe terrible or false things about ourselves. Tolkien understood this, I think because it's human nature. Call it the superego, call it common sense, call it pragmatism, call it learned helplessness, but the mind craves boundaries. Depending on the myths we believe in, those boundaries can be magnificently vast, or crushingly tight. “In the future, as in the present, as in the past, black people will build many new worlds. “And in that sliver of time, I felt the power around me coalesce, malice-hard and sharp as crystal. It was said that the gods favored fools because they were entertaining to watch. It was simply that I knew, or had known, precisely why he did not love all his children equally. Differentiation, variation, appreciation of the unique: this was part of what he was. His children were not the same, so his feelings toward each were not the same. He loved us all, but differently. And because he did this, because he did not pretend that love was fair or equal, mortals could mate for an afternoon or for the rest of their lives. Mothers could tell their twins or triplets apart. Children could have crushes and outgrow them; elders could remain devoted to their spouses long after beauty had gone. The mortal heart was fickle. Naha made it so. And because of this, they were free to love as they wished, and not solely by the dictates of instinct or power or tradition. But when I got angry, my nerves sought an outlet, and my mouth didn't always guard the gates. “You are insignifiant. One of millions, neither special nor unique. I did not ask for this ignominy, and I resent the comparison. But perhaps that was just the way of power: no such thing as too much. Peace is meaningless without freedom. Grief sounds like a bad thing," I said, frowning. "Why don't you and Naha and Mama get rid of it?" "That would require removing love from existence. There is no logic to grief. Want to see more pictures of N.K. Jemisin quotes? Click on image of N.K. 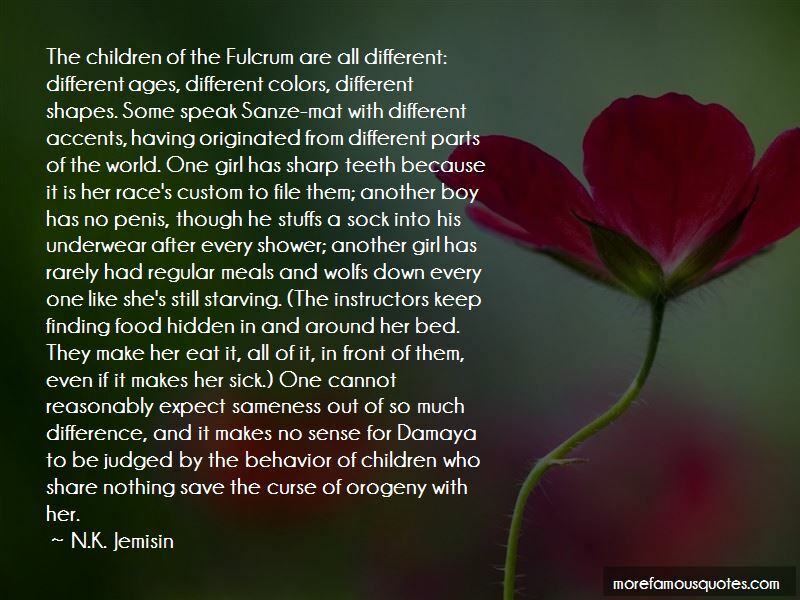 Jemisin quotes to view full size.